Send a single, splendid Rose to that special someone as a wonderful gesture to express your classic, discreet, understatement of the obvious; that you care. Available in a variety of colours to suit every occasionThe vase in the picture is not included, however if you would like to make your flower gift extra special, why not add a vase to your order? 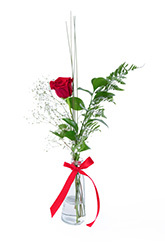 We recommend a Standard Vase to leave a lasting impression. Excellent service because my sweetheart got the rose in time when she was out of home shopping and they called advanced. She had to return in time and got the rose from a delivery driver. She loves it! Excellent service! Thank you for your phone call and for the punctual delivery!! Great service, really appreciated! !